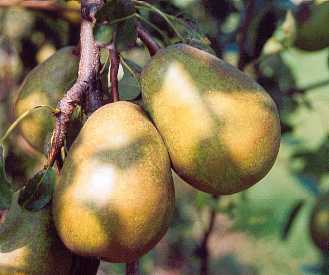 A mid season dessert pear highly prized in Victorian England. Raised by Abbe Duquesne at Mons, Belgium 1809. Named after Napoleon's second wife. Medium sized, long oval fruit. Smooth greenish yellow skin with some patches of brown russet. White, very juicy, slightly granular flesh. Moderate flavour. Weak growing tree with a spreading habit. Slow to come into bearing and not very reliable cropper.